Jason Wagner, Principal of Pelham Lab High School in the Bronx, first became interested in NYC Outward Bound Schools after visiting our Network School WHEELS, a visit he made while he was still in the planning process to open Pelham Lab. 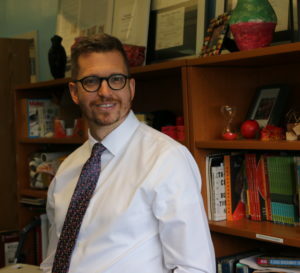 Right away, he knew he wanted to re-create WHEELS’ student-centered learning and character-rich school culture, and that he would need our support and expertise to do so. In the beginning, Jason and his team of educators worked with us to implement Crew, our powerful advisory structure. To Jason, a strong advisory program was essential to student success: “You can’t talk about student achievement without also talking about underlying social-emotional support.” And Jason knew that our Crew model, which focuses on developing trust and compassion and building skills like empathy and leadership, would help empower his students, many of whom feel marginalized in their communities, and insecure about their opportunities. The effect has been profound. Jason says, “[Students] can lean on each other. They can learn from each other.” Pelham Lab students are showing up to class more often, paying attention in class, and scoring better on exams. What will success look like? Kids feeling empowered to follow their dreams, pursue a meaningful career, and positively impact the world around them. Jason knows that if his students are engaged in the classroom, they’ll ultimately be engaged beyond it.